I’d been craving sweet potato fries and was looking online for some new recipes to try. I ended up finding this recipe for Sweet Potato Home Fries on my iPhone via the Food Network Canada app. There’s a ton of recipes on there! This one has only three ingredients: bacon, sweet potatoes and green onions. It’s made entirely on the stove top and the potatoes are cooked in the bacon drippings giving it so much flavour. Next time, I think I will cut the sweet potatoes into smaller cubes so they will cook faster. The bigger pieces took longer to cook and I was starving and didn’t want to wait that long! 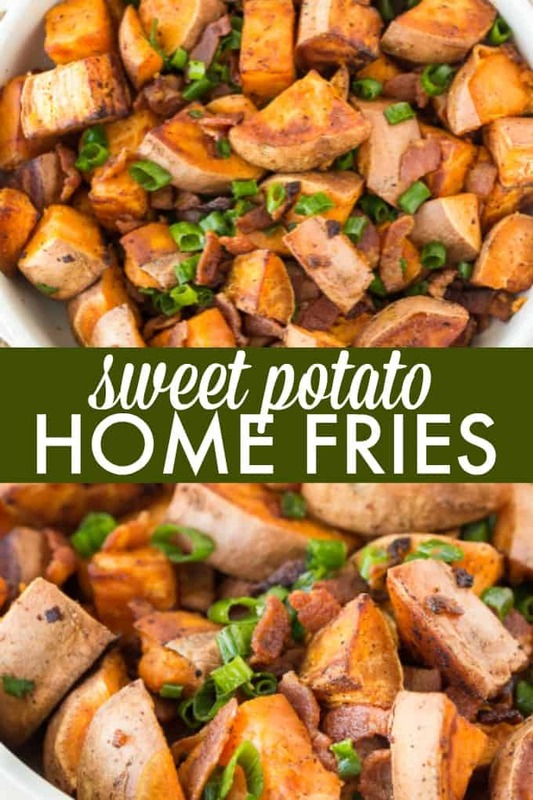 A mouthwatering side dish with only three ingredients: sweet potatoes, bacon and green onions! Heat a saute pan over medium high heat and add the bacon. Saute until crispy. Remove from pan. Add the sweet potatoes to the same pan. Brown them on all sides until tender (about 15 minutes or so). Toss in bacon, green onions and salt & pepper. What a great mix of 3 simple ingredients! I’ll definitely be trying this. I love sweet potatoes. Holy delicious. i could eat these at every meal! Love a good sweet potato and bacon combo. Totally trying these soon! Sweet potatoes are one of my absolute favorites. 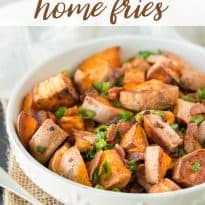 Now I can whip up these home fries for my next family breakfast. Inspired! I cannot live without sweet potatoes these days. Can’t stop, won’t stop and I am A-OK with that! Would be especially tasty with scrambled eggs from our chickens. Yummmmy, these look so good, great side dish for breakfast with anything. Will be making these soon. Like not having to have too many ingredients. Sure glad you shared this recipe, been needing to find some new dishes, very tired of old stuff. Delicious! Thanks for linkin’ up What’s Cookin’ Wednesday! I love sweet potatoes and this looks like a must try recipe! Pinning! 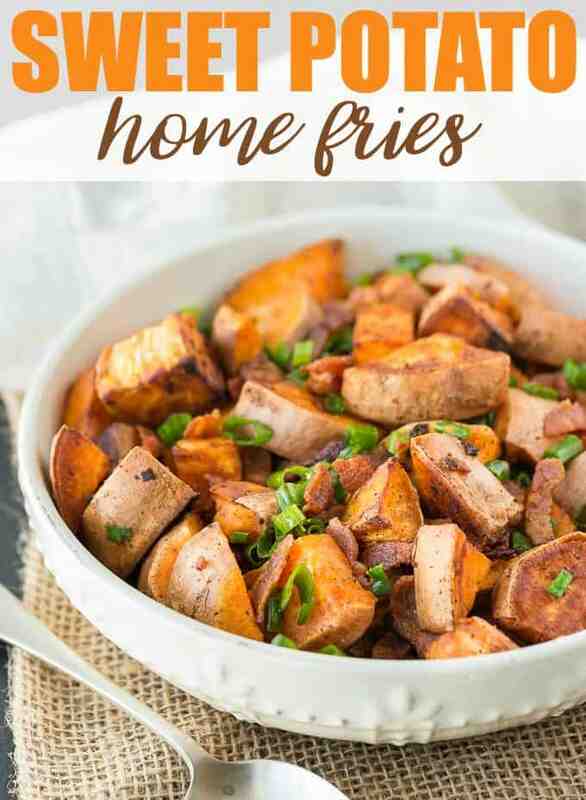 Sweet Potato Home Fries are always a hit here at the cottage! Hope you are having a great day and thanks so much for sharing your post with us at Full Plate Thursday. I’ll definitely be trying this,the kids love sweet potato!